Dr. Charley Adams and Hanan Hurwitz join Peter Reitzes to discuss the 2018 Joint World Congress being held in Hiroshima, Japan. 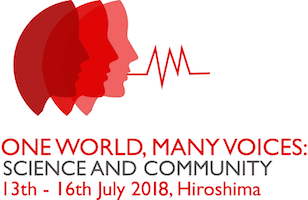 One World, Many Voices: Science and Community is the Inaugural Joint World Congress of the International Cluttering Association (ICA), International Fluency Association (IFA) and International Stuttering Association (ISA), with local host organizations the Japan Society of Stuttering and Other Fluency Disorders and the Japanese Stuttering Genyukai Organization. This event will be held in Hiroshima, Japan, from July 13th-16th, 2018. See the list of keynote speakers here and participate on the Facebook page. Hanan Hurwitz is a person who stutters, Director of Quality at Servotronix in Israel, serves on the International Stuttering Association’s Advisory Board and is part of the team that is planning the Inaugural joint world congress.